The North Fork trail climbs to Cherry Log Gap and I find a brand new trailpost put in by the Crosscut Mountain Boys led by Ken Jones and Rick Harris. Fodderstack Ridge is #95 and the BMT is #2. Out of view is #98 the North Fork trail. MORNING ALONG THE NORTH FORK CITICO TRAIL: A rainfree night has been spent in the nylon shelter but now I am up and preparing for my day hiking up this trail to Cherry Log Gap and the high Unicoi Ridge. 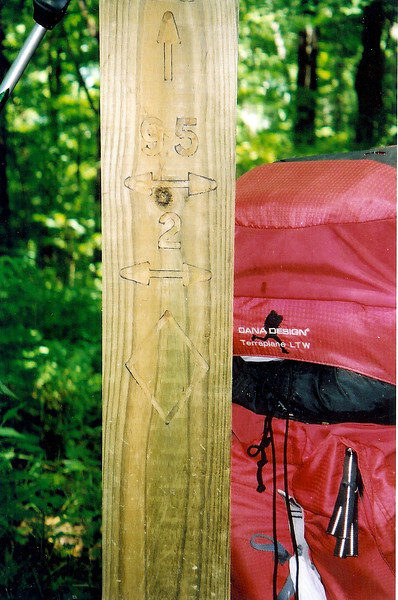 As soon as I put on the heavy pack I will reach the last 2 major crossings whereupon the trail steepens and takes me past several significant trailside markers such as the Blue Rocks, Old Goat Falls, the Rock Ledge with the footsteps carved in it, the Cold Spring trail intersection and the upper trail walk thru the creek. ON THE NORTH FORK TRAIL: Ok, I left Camp Seven and crossed #8 and #9 and went up the steep horse cut and past the Blue Rocks to arrive at Old Goat Falls for a long sweaty rest atop the big rock by the plunge. This is a pretty place and one that beckons to stay long and to explore, to sit by the water and wait, to think about the next hard climb and weep, to gladly reach the bowl section and rest again. Ok, here I sit resting at Camp 21 by the big rock stairway. After battling the low rhodo up this particular kind of Lost Valley, I am spent and yet anxious to keep backpacking upward to the ridge and into the shadows of Snow Camp. Here I sit at the high camp of the North Fork very hot and glad to be in the open bowl and out of the cursed rhodo. I will cool down and rest and then climb to the ridge in one final push where I'll set up camp and do a water run down the BMT. The open bowl is very steep but it isn't too long and I'll be happy to do it and get up to the 4,600 - 4,800 foot mark where it is cooler and breezy. I reached Cherry Log and found the new BMT trailpost showing trail #98 down the North Fork trail, #95 the Fodderstack and trail #2 the Benton MacKaye. OVERNIGHT AT SNOW CAMP: Ok, here I sit with the tent up and water fetched and suddenly Shunka barks and who shows up with trail tools in hand but Ken Jones. He is coming from the North and is carrying an axe, a bowsaw and a weed wacker. I gave him 18 ozs of freshly filtered water and we talked for 20 minutes and I said goodbye to Mister B Mac trail king as he took off down to Cold Spring Gap. Night comes to camp as a gentle wind begins to make some changes on the Fodderstack. Day 2 winds down and tomorrow hopes to bring a leisurely walk along Four Mile Ridge to enjoy the scenery and the cooler air at 5,000 feet. I will use all day to go slow and meander, to savor each mystical spot and tune in, turn on and drop out.